A stunning deciduous tree or multi-stemmed shrub which has two seasons of interest. In spring, tiny clusters of dense purplish green flowers are borne surrounded by large white showy bracts and in autumn the mid green leaves turn orange, red and purple for a fantastic autumn colour display. Reasonably hardy, it requires a long hot summer to promote best growth, positioned in full sun in fertile moisture retentive soil. Young plants would benefit from some frost protection in late spring until established. 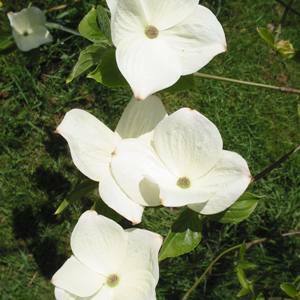 Cornus ‘Eddies White Wonder’s would make an excellent specimen tree for a small garden or for growing in containers in a city courtyard where it should be placed where the large bracts and autumn colour can be appreciated.